Written from an applications viewpoint—with many examples, detailed case studies, study problems, and tips included—the book covers the most common types of FMEAs, including System FMEAs, Design FMEAs, Process FMEAs, Maintenance FMEAs, Software FMEAs, and others. It also presents chapters on Fault Tree Analysis, Design Review Based on Failure Mode (DRBFM), Reliability-Centered Maintenance (RCM), Hazard Analysis, and FMECA (which adds criticality analysis to FMEA). Everyone wants to support the accomplishment of safe and trouble-free products and processes while generating happy and loyal customers. 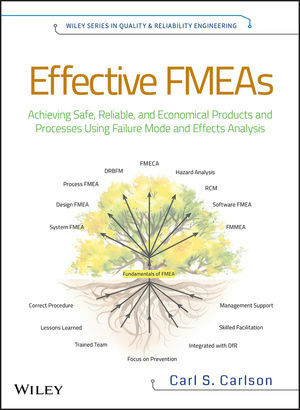 This book will show readers how to use FMEA to anticipate and prevent problems, reduce costs, shorten product development times, and achieve safe and highly reliable products and processes. CARL S. CARLSON is a consultant and instructor in the areas of FMEA, reliability program planning, and other reliability engineering disciplines. He also currently supports clients of ReliaSoft Corporation. He has thirty years' experience in reliability testing, engineering, and management positions, including manager of product reliability at General Motors. He co-chaired the cross-industry team that developed the commercial FMEA standard (SAE J1739, 2002 version) and was a past member of the Reliability and Maintainability Symposium (RAMS) Advisory Board. He holds a BS in mechanical engineering from the University of Michigan and is a Certified Reliability Engineer. http://www.wiley.com/go/effectivefmeas A companion website with figures and tables from the book.